Entertaining and fast-paced, if somewhat lightweight, Tatau's first episode sets up fun mysteries and boasts a pair of likeable leads. It's bright, breezy stuff. Remember how annoying it was when you found out your cool Chinese tattoo actually meant 'dog food'? Being Human producer Rob Pursey puts a dark spin on that in this eight-episode supernatural drama for BBC3, the first show the Beeb commissioned after it cancelled In The Flesh and announced the channel would go online-only some time in the near future. 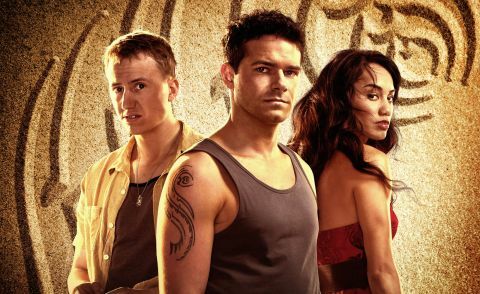 And while Tatau's far lighter in tone than its supernatural BBC3 predecessors, it's still a fun, fast-paced romp. When buddies Kyle (Joe Layton) and Budgie (Theo Barklem-Biggs) leave Croydon for the sunny Cook Islands, they're up for anything – including sampling local brew Tavi, which induces feverish hallucinations. In Kyle's case, he glimpses a girl in a red dress who begs him for help, but is she just a figment of his drug-addled imagination? Meanwhile, Kyle discovers the tattoo he doodled is actually an ancient Maori symbol, and when he glimpses his dream girl drowned in the ocean, he's sure something's afoot on the island. Sun-soaked and action-packed, this first episode doesn't mess about. A dialogue-free pre-credits montage gets the backstory out of the way before plunging us head-first into the boys' tropical adventures. It's refreshingly brisk, reclaiming island paradises from reality dross like Ex On The Beach, and recalling Being Human in its 'hunks with heart' set-up (both leads seem cripplingly shirt-phobic). Layton and Barklem-Biggs make a good double act, too, transcending what could have been stock roles. Layton dodges 'broody' cliches, though he's at times overly earnest, but Barklem-Biggs is the real surprise. Most recognisable for his comedy stint on The Inbetweeners Movie, his Budgie (ahem) develops over the course of one episode from comic relief to a character with surprising depth – and a shady history that lends itself to gritty drama down the line. Though it can feel a little lightweight, Tatau promises a more epic scope than a lot of BBC3's more high-profile output, and it manages to imbue its 'Sunday tea-time' premise with shards of darkness. “It can be magical or deeply disturbing,” a bartender warns the boys of devil brew Tavi, but she could be talking about the show, too. While shying away from the darkness of Being Human's later years, there are skin-crawling moments, including that creepy vision of a drowned girl chained to the ocean floor. And though this first episode only skims the surface of Maori mythology, it hints at everything from conspiracies and dark magic to corrupt community leaders (Temuera Morrison is a highlight, oozing menace despite limited screen time). “You ever seen The Wicker Man? I think this is the sequel,” jokes one character. Tatau's not quite on the same level, but it's hard not to get swept up as the Maori madness unfolds.